Vekoma, once a paddock buddy of fellow Kentucky Derby (G1) hopeful Code of Honor at Lane’s End, has shown an indomitable spirit throughout his life. By Candy Ride – the same sire as champion and Derby rival Game Winner as well as 2017 Horse of the Year Gun Runner – Vekoma is out of Mona de Momma, who starred in the Humana Distaff (G1) on the 2010 Derby undercard. Rallying from far back in the slop, Mona de Momma defeated two Breeders’ Cup Filly & Mare Sprint (G1) champions at Churchill Downs that day. Reigning Breeders’ Cup winner Informed Decision was third, and Dubai Majesty, an uncharacteristic last in the Humana Distaff, went on to capture the Filly & Mare Sprint over the same track later that year. That Grade 1 laurel made Mona de Momma an even more outstanding broodmare prospect. She already had the pedigree as a daughter of Speightstown and direct descendant of French champion Lianga, thereby from the family of noted sires Mr. Greeley, Danehill Dancer, and 2007 Kentucky Derby champion Street Sense. Accordingly, Jon Clay’s Alpha Delta Stables went to $1.55 million to purchase Mona de Momma, by that point in foal to Malibu Moon, at the 2011 Keeneland November Sale. She would produce three foals for Clay, but sadly Vekoma turned out to be her last, a parting gift before she passed away when he was a yearling in 2017. “I miss her and I wish she was still around,” said the New York-based Clay, whose Kentucky mares reside at Lane’s End. Thankfully he still owns one of her daughters, the five-year-old Bloody Point by War Front. Vekoma certainly inherited those great genes, expressed in his fine mind, natural ability, and strong attitude that resonated with his early caretaker, Justin Wimpy. A former Lane’s End employee, Wimpy recalls that Vekoma had a brief illness as a newborn. But he got past it in short order, and his toughness went hand in hand with a personable nature. Wimpy forged a close bond with the baby he affectionately nicknamed “Monkey,” to this day emphasizing “how much this horse means to me. 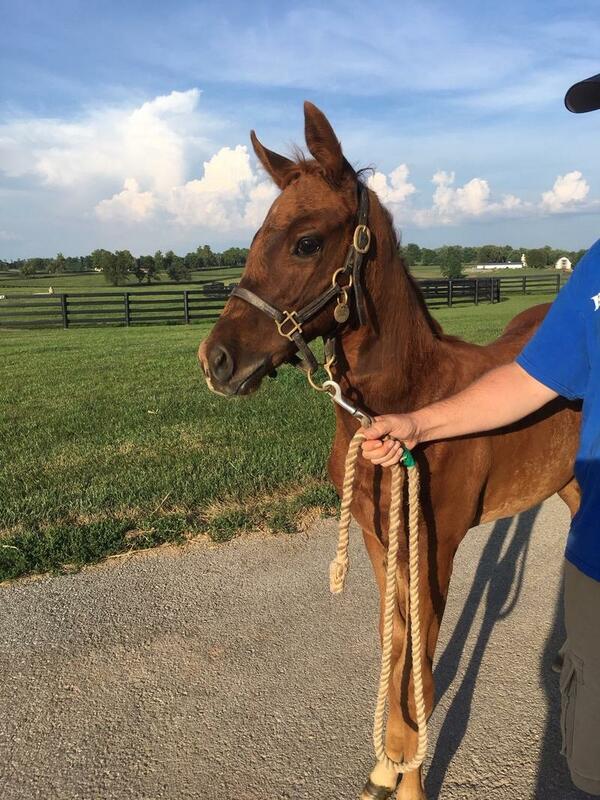 Born in the same foaling barn as Code of Honor, who was bred by Lane’s End proprietor Will Farish, Vekoma would also grow up with him among the cohort of weanlings, and eventually yearlings gearing up for the Keeneland September Yearling Sale. The yet-unnamed colt handled his sales preparation with aplomb. As a late foal born May 22, and not very big, Mona de Momma’s colt by Candy Ride didn’t attract top dollar at the fiercely competitive sale. So Randy Hill got a relative bargain when buying the well-bred youngster for $135,000 in the name of his R.A. Hill Stable. His friend and partner Mike Gatsas, who races as Gatsas Stable, also bought into the colt. Now named Vekoma, after a Dutch company that designs and manufactures roller coasters and amusement park attractions, the chestnut was sent to Steven Venosa in Florida for his early training. He soon presented himself as a serious prospect. But Vekoma turned out to be eager to get on with the job. “Very forward, very willing, extremely quick learner,” Venosa recalled, describing him as “well mannered, extremely bright, smart. And when Vekoma was paired up to work in company, he already had the heart and determination of a racehorse. Vekoma was acting very much like what his connections call an “RSB,” discreet shorthand for “a running SOB,” and they were excited about possibly breaking his maiden at the prestigious Saratoga meeting. But his racetrack trainer George Weaver counseled a more patient course. After his arrival in Weaver’s Saratoga barn last summer, he wanted to give him a little extra time to get ready. That policy paid off as Vekoma verified his “RSB” label first time out at Belmont Park September 23. Not only did he score in a swift 1:08.93 for six furlongs, but it proved to be a hot maiden race that produced a couple of next-out winners, including future stakes scorer Mihos. Vekoma himself came right back to take the November 4 Nashua (G3) at Aqueduct, beating subsequent Remsen (G2) runner-up Network Effect and multiple graded stakes hero Call Paul. Although the Remsen would have been the next logical spot for Vekoma, Weaver again opted to exercise patience with a view toward the long term. He was freshened ahead of tackling the Derby trail in earnest this season. After a better-than-appears effort in his Fountain of Youth (G2) comeback, where he was third to fellow Lane’s End homeboys Code of Honor and Bourbon War, Vekoma roared back to win the Blue Grass (G2) handsomely at Keeneland. His return to Kentucky set the scene for a fortuitous reunion with his pal from baby days, Wimpy, who now works for trainer Tom Amoss. Through the good offices of Weaver’s assistant, Heather Coots, Wimpy was able to help out with Vekoma before and after the Blue Grass, and had the thrill of escorting him back triumphant. “I’m blessed and honored to have the opportunity to be a part of his life,” Wimpy said. Also proud of Vekoma’s exploits is breeder Clay, who is delighted to “have a rooting interest in the Derby this year. Given his personality, you know Vekoma will try his utmost.